RockMuzine caught up with A.A. Nemtheanga from Primordial for a short interview before their show in 013, Tilburg, Netherlands, to talk about the latest album ‘Exile Amongst the Ruins’, band’s longevity and life. RMZ: The new album is out and there’s definitely been a diversity of reactions. The reception was most appreciative, but some reviews were quite harsh, basically implying saying the band sold out to the mainstream. What’s your take on this opinion? Do you even relate to that? AA: No, not really (laughs). I don’t really read reviews, I don’t really care. Look, for the last few years, I suppose Primordial always had a sort of privileged place when it comes to criticism. We usually have 90-95% of very strong reviews and, I guess, sometimes people just get sick of you, they get tired and it’s time for them to turn against us. As far as the latest album goes, according to the label, 80% of reviews are very positive, a few people don’t really understand it or don’t know what we were about in the first place. I think it’s a strong album, there are some people confused by some of the songs, but after nine albums you just have to try and take few sidesteps. RMZ: This leads to my next question. On most of the tracks, the sound of the band and your vocals, in particular, are presented in a new way. They are also strikingly diverse throughout the album, just like ‘Stolen Years’ track is different from ‘To Hell and The Hangman’. Did you enjoy the experience of exploring abilities of your vocal chords? 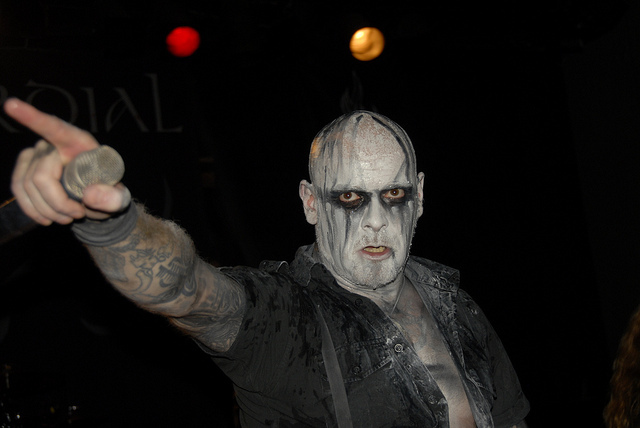 AA: Primordial always had all kinds of vocals, from black metal to clean singing and back. We’ve always had it, it’s just with every album we try to add a couple of strings to the bow every album, try to evolve as musicians. I’m also at a period of my life, physically, where my voice changes, so I try to add few textures here and there. Again, to me, this should never really surprise people, there’s lots of different singing on older albums. Sure, ‘To Hell and The Hangman’ is a bit of a gothic voice, but you can also hear it on ‘Graven Idol’ from ‘A Journey’s End’ album. When you have a great body of work already, it’s easy for people not to pick up details, that you’ve already flagged. Sure, some people were surprised, that there are less ‘heavy-metal, chest-beating’ songs, but we still have ‘Empire Falls’ or ‘Where Greater Men Have Fallen’, haven’t we? RMZ: In the press release for the album, it was mentioned there’ve been some uncomfortable situations around the recording of the album. How would you describe the influence it had on the resulting sound and mood? AA: Oh well, press releases are designed to make talking points out of pretty mundane things. What might have happened is that we just didn’t get to rehearse that much. We’ve recorded the album on weekends in between our lives. It was a little bit under-rehearsed. Maybe that’s why the album sounds a bit spontaneous, maybe that’s why it sounds a bit different since we didn’t get time to move songs in-line with the usual Primordial stylistic. But, like I said, it’s just trying to make some talking topics out of it. Yeah, sure, I didn’t enjoy doing it, but being under-rehearsed is not good for a singer, first of all. If you’re a guitar player, you have your riffs, it’s all like a book. Singers do not always have that and voice is also a muscle, you have to exercise it. So it does not always come out as expected. RMZ: Lyrics of Primordial often touch upon events, related to historical events, in particular, Ireland’s. Would you call yourself a patriot, in a political sense or a social sense? AA: Well, people often think we sing about the history of Ireland. But, in fact, we address things universally. There are some songs, of course, like ‘Coffin Ships’ (about The Great Irish Famine), but most of the songs are written in a way so that you can apply the ideas to your own world, so you can see the ideas of martyrdom, sacrifice, and alienation. We’ve always tried to ask people to try and put the songs into social/political/cultural context of the past. I’m not really interested in writing fantasy stuff, so it has to be realistic stuff. As for being a patriot, you know… What’s the difference between a nationalist and a patriot? My opinions on Irish nationalism changed as I grew older because the history of Ireland in the 20th century is very-very dark. It’s a catalog of abuse, abuse by the church, hidden by people themselves, full of really undignified things done to children and women of 20th century. So, that (Irish) flag means something else to me. Me of 20 years ago would say “I’m patriotic”, but it has changed a lot as I grew older. At the same time, there are great things happening to Ireland. As far as the lyrics go, I’ve always tried to tell a story more about European politics, than Irish. RMZ: As a band, you’ve been going strong for almost 30 years and you keep being actual, you keep releasing albums without repeating yourselves. What particularly contributed to the band’s longevity, what’s the secret, so to say? AA: I think it’s a couple of things. First of all, we don’t over-tour, we didn’t have to spend so much time together, we never burned the candle at both ends. Also stubbornness, I suppose, some sort of refusal to change. It’s sort of an institution, well, at least for me, it’s been since I was 16, through my whole life. We can leave it behind for few months, not rehearse, then come back and be fine, it’s not a social thing, it’s an institution indeed. We didn’t start the band as friends and we never got bored of it. And I guess all of us are sort of similar now to people that started the band, we didn’t drift away. RMZ: If you could speak to the whole population of Earth, what message would you try to convey? AA: “Get away from Facebook”. I mean, originally, the idea of Internet or mass social communication seemed like a positive thing, a tool we could use. Nowadays, it’s a tool that uses us and it’s affecting us in ways we don’t really understand, it seems to bring the absolute worst out of people. I think it’s a cancer of society, it’s turning us into divided, angry, polarised, manipulated and ill-informed people. RMZ: Ok, we get rid of it, what do we use instead? AA: It won’t help, it’s all technology, you know, something new would appear. Technology is outstripping our ability to understand and integrate with it. It’s Orwellian. RMZ: That’s one way to put it. Ok, the last question for today. If you wouldn’t be in Primordial, what would you be doing now? AA: Oh, I guess I would be a retired professional football player. I don’t know, it’s difficult to tell, I would’ve had to find a way to get rid of all this energy, all this creativity, whatever it is. Maybe go teaching, affect people in a positive way. I really don’t know, but it’s a strange thought, it’s been so long now, I’ll have to go back to being 15 years old to tell you. But I always had a lot of interest in sports, so maybe that. RMZ: Thanks a lot for your time, Alan.